Bywhe's Four Stoves For This Winter | Bywhe Renewables Ltd.
Well! Summer seems to be coming to an end, and we will soon be back to those cold winter months again; why not make this winter warm with some of our finest Klover biomass stoves and get paid to heat your home? 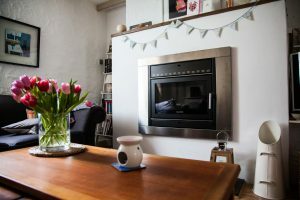 This is a list of our four favourite biomass stoves, ideal for a range of different properties and styles, some come in a range of colours to perfectly suit your home and your heating needs. First up is one of the newest stoves from Klover. Rob saw these being produced in the Klover factory when he visited Italy recently, ahead of it’s release. 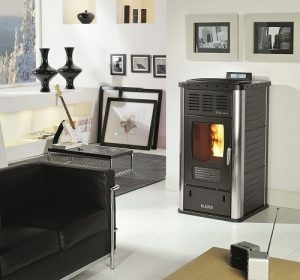 It is the best performing stove in its class, producing 26kW of heating power with 21kW going to hot water heating, and 4kW going into the room through it’s hot air fan system, allowing hot air to be blown into the room where its fitted. It makes an attractive, yet functional addition to any room. The Belvedere 28 comes in six different colours to fit into any decor. Here at Bywhe, we are in love with the Bordeaux colour way! A Smart 120 in a worktop. The Smart 120 pellet cooker will take care of all your heating and hot water needs. 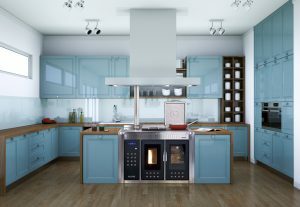 It will also give you a hot oven and hotplate when the stove is running, as well as being a really stylish addition to your kitchen. As with all Klover wood pellet boilers, the Smart 120 is superbly built and designed with great attention to detail. You can set it exactly as you would an oil or gas boiler so that it comes on and goes off to fit in with your schedule, meaning you have heating and hot water when you want it. The stove is designed to fit in the space of an oil fired/solid fuel range cooker and is an ideal replacement, if you have less space however, there is the Smart 80, which is a smaller version on the Smart 120. Klover really care about customer feedback, and have recently brought out the Smart 120 in a more traditional style available to view here). As with all the pellet stoves, we can support you in claiming your RHI payments, meaning you are paid to heat your home! A Pellet Fire Place inset into a living room wall. Another stylish choice from the Klover line up, the Pellet Fire Place is an inset stove, with an integrated hopper. This stove is set on rails so that it will be accessible for servicing. With its large glass pane on the front and the stylish stainless steel design, we think it looks gorgeous in any living space and would be a great a talking point to visitors. Not only is it an attractive, it also heats your water and warms your home! Last but certainly not least is the Diva Mid. Klover’s most popular boiler in the Diva range. With a potential output of 20kW with 17kW to central heating and hot water and the remaining 3kW to the room. It is another functional yet aesthetically pleasing stove. With the optional fans, it is able to circulate more heat into the room that it is placed into. The Diva Mid comes in 6 colours. This boiler is a favourite of our office staff, as it keeps them warm in the winter months. We have one placed in the corner of the office, supplying heat to the room but also supplying hot water and central heating to another building. Klover is our Biomass Boiler choice, we’re impressed by not only the stylish designs but also the time and expertise that has gone into the design and functionality of these boilers. We hope you enjoy looking at our favourite choices of biomass boiler this winter. If any of these interest you, or you’d like a free no obligation survey then please contact us, and we can arrange a site visit.